Everyone needs something special to look forward to in the middle of winter. Paws Up has the answer: their second annual WinterFest. Like their Montana Master Chefs event, this gourmet weekend features outstanding guest chefs, wine pairings, coffee roasters and plenty of wilderness adventures. However, this event will include many more educational activities and hands-on opportunities. Paws Up Executive Chef Ben Jones will be joined by Chef Colby Garrelts and Chef Megan Garreltsfrom the Kansas City restaurants Bluestem and Rye and Top Chef Season 10 first runner-up and Paws Up favorite Chef Brooke Williamson, the co-owner/co-chef of Playa Provisions, The Tripel and Hudson House. Kelly Liken, of Iron Chef America and Top Chef fame and a three-time James Beard Award nominee for Best Chef Southwest, will round out the talented cast of featured chefs. Master Sommelier Chuck Furuya will select hearty, blood-warming wines for the winter-themed meal. All of the hosts will be giving demonstrations and presenting intimate seminars, so the festival will provide unique opportunities to eat with—and cook with—some truly fantastic culinary talents. As an added bonus, Austin-based singer-songwriter Brian Pounds, who first gained national recognition on NBC’s The Voice, will be WinterFest’s featured musical performer. To make reservations for WinterFest, please call luxury travel advisor Jen Mitchell at 239-431-6734 or email us at [email protected]. *Dinners during Paws Up culinary events are multi-course meals often prepared by guest chefs from around the country. Chefs often cook their own signature cuisine or create meals based on a theme, such as a specific ingredient or holiday. Because these dinners are “chef's choice,” there can be absolutely no substitutions or variations from the menu. If you have dietary restrictions or preferences, you are invited to dine with your particular restrictions in mind. 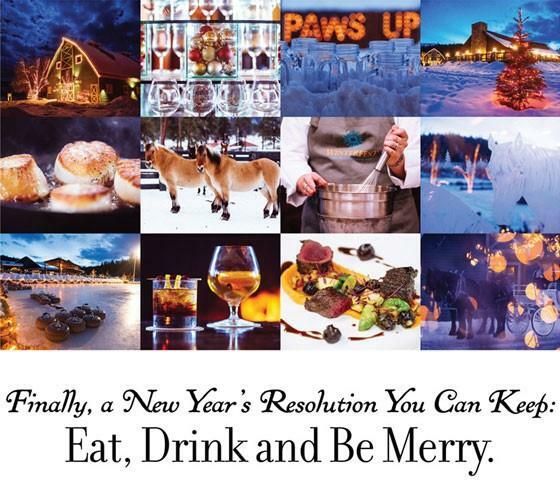 If you have strict dietary restrictions, we strongly encourage you to visit Paws Up at a time when our executive chef can cater to your specific needs.